Usually a winter annual but occasionally a summer annual that forms dense, prostrate mats. 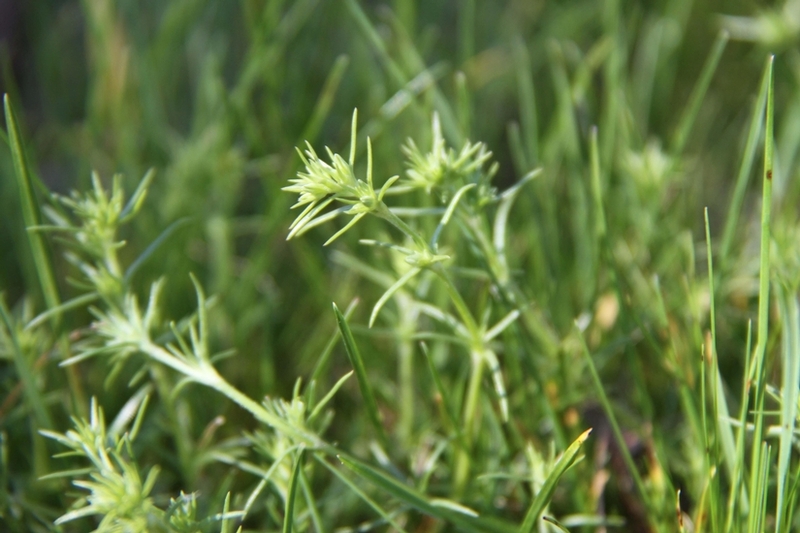 Knawel is commonly mistaken as a grass and is primarily a weed of lawns, turfgrass, and small grains. Knawel is distributed throughout the eastern United States. Cotyledons are linear in outline and less than 1 mm wide with a sharp tip. This leads to their confusion with grasses. Linear in outline, less than 1 mm wide, also with a sharp tip. Leaves are arranged oppositely along the stem and joined by a thin, clear membrane. 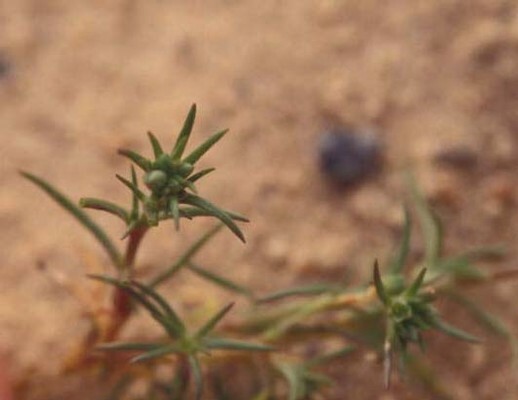 Grow prostrate along the ground, branched, forming dense mats outward from a central plant. Flowers are inconspicuous, green in color, and somewhat spiny. Flowers occur in clusters that arise from the position between the leaf bases and the stem. A very small (3-4 mm) utricle. Taproot and a fibrous root system. 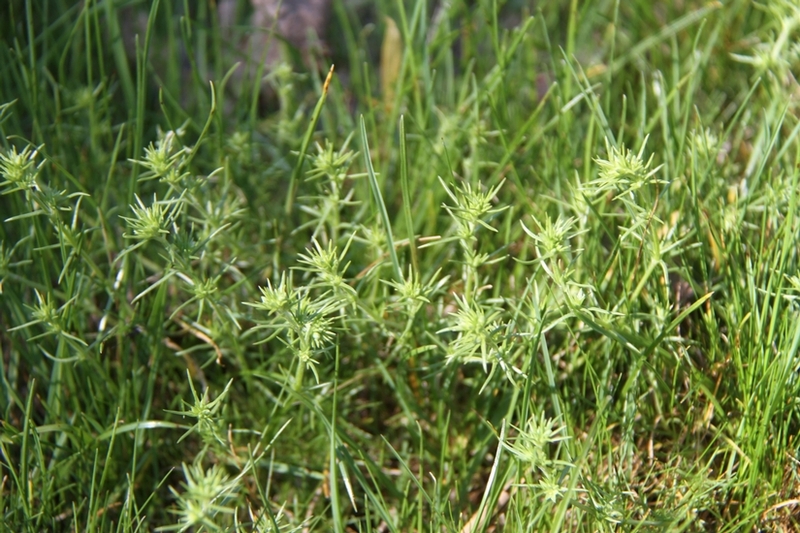 Plants with small, linear leaves that initially resemble a grass and inconspicuous green flowers. 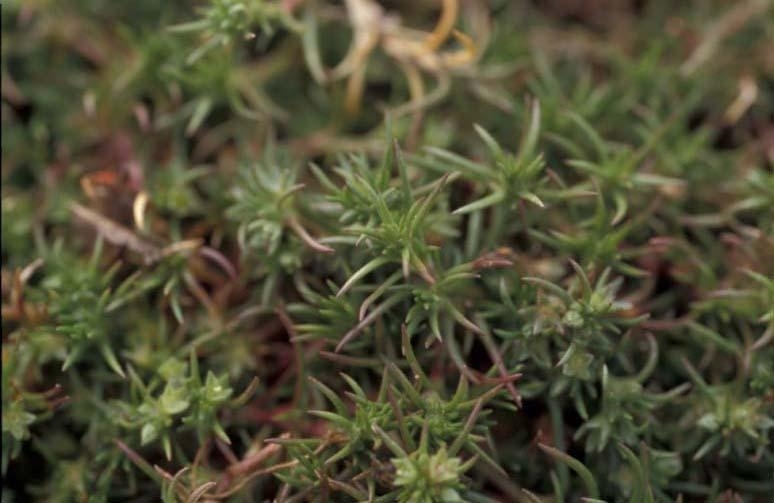 Due to the overall growth habit and leaf shape, this weed might be confused with Creeping Phlox (Phlox subulata), but the leaves and stems of German moss are not covered in hairs like those of creeping phlox. German moss might also be confused with some of the Spurries (Spergula] spp.) but lacks the distinctive white or red flowers of these species.